Contemporary in design, yet with stylish oriental flair, Mandarin Oriental, New York redefines luxury as New York City’s most striking and sophisticated hotel. 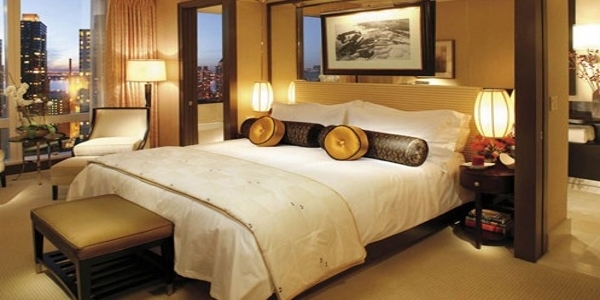 The 251 room property includes 48 luxurious suites and is situated at the union of Columbus Circle and Central Park. Mandarin Oriental, New York’s floor-to-ceiling windows captivate guests with commanding views of Central Park, the Hudson River and the Manhattan skyline. Each guestroom features state-of-the-art technology; from a highly personalized home theater experience providing surround-sound stereo including CD and DVD options, digitally delivered high-definition video on large flat panel LCD televisions, laptop connections to the in-room LCD television, high speed internet access and more. To further enhance the guest experience, the hotel offers Asiate- an exciting, trend-setting restaurant presenting an artistic and modern approach to French and Japanese cuisine; extensive meeting and catering facilities, as well as The Spa at Mandarin Oriental, New York- a 14,500 square foot spa with a fitness center and 75-foot naturally-lit lap pool. An oasis of ultimate relaxation and rejuvenation high above New York City. The Spa at Mandarin Oriental, New York is a five-star spa offering holistic renewal in a setting of complete tranquillity. Facilities including a state-of-the-art fitness center and a 75-foot naturally lit indoor lap pool. Bamboo, stone and gold leaf set the tone for an unforgettable Manhattan spa experience that focuses on the rebalance of the individual, and leaves them with an enhanced sense of wellbeing. The Spa at Mandarin Oriental is open from 9:00 am – 9:00 pm seven days a week. With a superb swimming pool and in room yoga classes you don’t have to expend too much energy in looking out ways to keep fit while in town, however there are plenty of other options to meet your particular enthusiasm and we’ve detailed them below. If it’s tennis you’re looking for, the Manhattan Plaza Racquet Club is just 5 minutes away. Five courts, both indoor and outdoor, are available day and night. Non-members have access Monday-Friday 12noon till 6pm. Rentals are available. There is also a Pro-shop available if looking to purchase. Our 75-foot naturally-lit indoor lap pool is located on the 36th floor of the hotel. With floor to ceiling windows and a view of the Hudson river, it’s the perfect place to escape the city below. Operating house are Monday-Friday 6am-9pm, Saturday 7am-9pm and Sunday 7am-7pm. Various class types and levels are offered and can be tailored to each guest depending on their needs. Personalized yoga sessions can be set-up within 24 hours of a guest’s request. A one hour class is USD 180. For more information or to make an appointment, please contact The Spa at +1 (212) 805 8880. 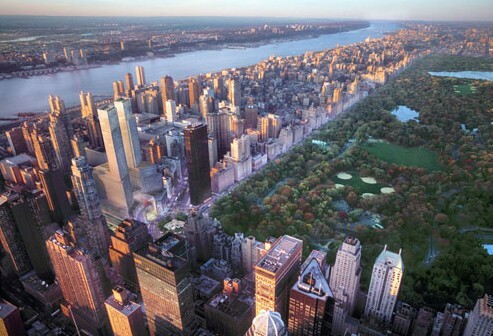 Central Park, with 843 acres in the heart of Manhattan, is one of the world’s most popular places to run. Maps of the area can be provided by the hotel. Chelsea Piers is NYC’s favorite place to play for people of all ages. It features activities for everyone: skating rinks, basketball courts, gymnastics training center, indoor soccer fields, batting cages, an outdoor ice skating rink, an Extreme Park for aggressive in-line skating, a health club with a 25-yard swimming pool, basketball courts, sand volleyball, boxing ring, the world’s longest indoor running track, a rock climbing wall, cardio and strength-training equipment, a golf club with 52 heated hitting stalls and a 40-lane bowling center. It’s suitable for all ages and costs USD 25 per person. There are over 150 beaches on Long Island, both bay side and facing the Atlantic. It is warm enough to swim in from July to September and the more accessible beaches can be very crowded in the summer. The beaches feature sand dunes, trails, miles of boardwalk and some are supervised. In the summer many of New York’s biggest outdoor concerts are staged on Jones Beach. A day trip to the beaches of Long Island on the peninsular that runs to the East of Manhattan is quite feasible. Beaches are less than 50 km away but generally the further you travel the better the beach with some of the most superb stretches in the Hamptons, the area inhabited by socialites and celebrities. Driving will take approximately 1 ½ hours or you could take a train from the LIRR, Long Island Rail Road direct to Long Beach. New York has some fabulous activities for children, and being based at Mandarin Oriental will set the scene, we go out of our way to make families feel at home. Below you can see the many facilities within the hotel that will help keep children of all ages occupied and comfortable and we have also compiled a comprehensive guide to family entertainment in the city. Any further requests? Our concierge will be delighted to help you. Items to childproof guest rooms – for example, outlet covers and bed rails. Baby-sitting services are available and can be arranged with our Concierge department. Please call (212) 805 8890. To avoid disappointment, please allow 24 hours in advance of need if possible. Mandarin Oriental, New York offers children a selection of game consoles. Upon arrival, our Housekeeping department will deliver the game console of your choice. Event planners are always reassured by the hotel’s calming oriental charm and award-winning service. The view of Central Park and the Manhattan skyline is just one of the many features that sets the hotel apart from the city’s other top venues. To see how we deliver flawless events please see details below on our flexible room designs, services and cutting edge technology. Each event space has stunning views over Manhattan. Located at the top of the modern Time Warner Center, the building and all our spaces incorporate the most advanced technology. Our rooms are also easily adaptable for both an executive retreat or major conference for up to 600 delegates. We have a dedicated chef running our catering team ready to respond to your specific brief, expertly creating themed menus from Moroccan feasts to Oriental banquets. We also take a creative approach such as our original business lunch Bento boxes. Our Conference Service Manager is a vital factor in delivering an atmosphere of reassuring calm and providing a rapid response service to solve problems before they arise. Our technology is the most advanced with fibre optic cables wired into the modern building structure. We have extremely well equipped fitness center and 75 foot lap pool, both with superb views over the Hudson River. Our Five Star Spa is staffed with highly professional therapists who provide a range of holistic treatments. The Time Warner Center, where we are located, is Manhattan’s newest hub for shopping and fine dining. Mandarin Oriental, New York offers one of the most striking event locations in Manhattan distinguished by the stunning views from our event spaces and guestrooms. The magnificent backdrop of Central Park and the Hudson River will make your occasion truly special. With our legendary service, creativity and meticulous attention to detail, our social catering team will bring your unique vision to life. And when you hold your wedding with us we’ll arrange a complimentary honeymoon night, with Weddings and Honeymoons by Mandarin Oriental. Located high above Columbus Circle, our 248 stylishly appointed rooms and suites reflect the oriental heritage of Mandarin Oriental while incorporating contemporary elements of New York City. And with every one of them comes a breathtaking view of Central Park and the Manhattan skyline, or the scenic Hudson River over which the sun sets. As if there wasn’t enough to watch on our state-of-the-art home entertainment system, these rooms also have spectacular floor-to-ceiling views of the Time Warner Center and Manhattan. The black, red and grey or cream décor complements 1940s elegance with Asian cherry wood furniture and custom designed Fili D’oro linens. And for guests in New York on important business, there’s everything they need, including high speed Internet access – which is sure to come in use for guests on a vacation, too. Accessible rooms available. These rooms have additional features for guests with disabilities. Approximately 420 square feet/39 square meters. These cream, white and brown rooms have two oversized-twin beds and spectacular, floor-to-ceiling views of Manhattan. As with all our rooms, they enjoy the latest in cutting edge technology, including a surround sound home entertainment system. The granite and marble bathroom features a unique soaking tub with picture windows overlooking New York. Approximately 410 square feet/38 square meters. You’ll find a king bed in every one of these stunning rooms, not to mention spectacular floor-to-ceiling views of the Hudson River. There’s a view of the river from the bathroom, too, and our unique soaking tub is an irresistible vantage point from which to enjoy it. The color scheme is gold and black, and the room is appointed with everything you need for work or leisure, including high speed Internet access and a state-of-the-art home entertainment center. Approximately 400 square feet/37 square meters. There’s no better way to begin a New York morning than watching the sunrise over Central Park from the comfort of a king bed. It’s a daily treat from these rooms with their unparalleled floor-to-ceiling views of Central Park and Midtown Manhattan. The tone of the rooms themselves is set by their luxurious décor and elegant appointments, such as Asian cherry wood furniture, Italian granite vanities and custom designed Fili D’oro linens. Approximately 425 square feet/40 square meters. Views from these higher level rooms are even more spectacular. There’s always something to watch from the full length picture windows as Central Park and Midtown Manhattan unfold before your eyes each morning. But that’s assuming you can stay away from our state-of-the-art home entertainment system, with access to numerous TV channels, and hundreds of CDs and DVDs. And should work intrude on your day, you’ll also find a full range of business facilities. Approximately 425 square feet/40 square meters. These one-bedroom, king-bedded suites have a separate living room, providing a welcome escape from the rigors of the day. Here you’ll find the latest in cutting edge entertainment technology including a surround sound home entertainment system, as well as everything you could need for business. In the Spanish marble bathroom, you’ll find a picture window overlooking the Upper West Side of Manhattan and an inviting soaking tub from which to enjoy the view. There’s also a separate powder room for your guests. This cream and brown suite with touches of red is also available with a king-bedded connecting room, making it ideal for family stays. Approximately 800 square feet/74 square meters. Located on the northeast corners of the hotel, these suites feature expansive views of Central Park and the Manhattan skyline. In addition to the bedroom, there is a separate living room and a guest powder room. Throughout Central Park View Suites, the cream and brown décor with accents of green and grey is luxurious, combining 1940s elegance with Asian cherry wood furniture and custom designed Fili D’oro linens. The finishing touch is the original artwork, which abound throughout and bring a welcome reminder of the oriental elegance which is so much a part of the hotel. Approximately 820 square feet/76 square meters. Located on the southeast corners of the hotel, the luxurious décor of these suites are cream and brown based with touches of red, orange, and grey. Premier Central Park View Suites are also available with a connecting deluxe double or grand deluxe double offering extra space to accommodate additional guests. This makes them the ideal choice for a family visit or for colleagues on a business trip. Either way, guests will appreciate the separate living room as well as the spacious work area. With a myriad of home entertainment options, there is plenty to keep you entertained. But even then, it will have to be good to compete with the view – from the verdant park to the glittering nocturnal cityscape, there’s always something outside the picture windows to catch your eye. Approximately 800 square feet/74 square meters. The two bedroom, 2.5 bath Taipan Suite showcases stunning views of Central Park, the Hudson River and the Manhattan skyline with clean classic lines, sophisticated urban-chic décor, Asian accent pieces and hints of Art Deco. Warm, earthy tones with gold accents are used in the living area, the master bedroom is done in hues of gold, deep red and pomegranate, and the second bedroom has a cooler silver, teal and white color scheme. The Taipan Suite also boasts a wet bar with Bisazza tiles, a living room and a picture window above the tub in the master bathroom. Approximately 1,210 square feet / 113 square meters. Located on the 52nd floor, The Oriental Suite is a symphony of blue, grey and gold. It has a large master bedroom and bathroom, and a separate walk-in closet. It also includes a living area, dining area, and a separate study that can double as an entertainment center or work space. There’s a deluxe kitchen with custom designed Italian cabinets, granite countertops and flooring. Over USD 100,000 of state-of-the-art Bang & Olufsen entertainment technology is installed throughout the suite, delivering the ultimate audio and visual experience. Artwork in the suite follows the direction throughout the hotel, using a mixture of New York and oriental influences. Approximately 1,800 square feet/167 square meters. From its location on the 53rd floor, the luxurious two-bedroom Presidential Suite presents a panoramic view of Central Park and the City skyline. It is the perfect retreat, complete in every way, with its separate large living and dining area, gourmet kitchen and Mozambique wood-paneled study. Throughout, it features unique, embellishing touches such as handcrafted oriental rugs and artifacts from both New York and the Orient. The walls of the master bedroom are upholstered with silk, and a spacious walk-in closet is paneled with sycamore. The master bath, outfitted with honey onyx walls, features separate over-sized soaking tub and glass-enclosed steam & shower for two. The Suite features over USD 100,000 of state-of-the-art Bang & Olufsen entertainment technology, including a 65 inch plasma screen television, five independent audio zones, and Blu-ray HD-DVD player. The Presidential Suite’s color scheme accents dark-toned furniture with shades of apricot and a hint of Chinese jade to create a space that is elegant, soothing and stylish. From its vantage point, it is a breathtaking setting from which to enjoy New York in unforgettable style. The restaurants and bars at Mandarin Oriental, New York offer innovative food & beverage concepts in a city that is renowned throughout the world for its variety of cuisine. The Mandarin Oriental, New York experience comes to life in the simplicity, elegance and vitality of its restaurant, Asiate. As Manhattan’s favorite celebration destination, restaurant Asiate elevates guests’ dining experiences to new heights with gracious service, inventive cuisine, an award-winning wine collection and stylish design that is only surpassed by the stunning floor-to-ceiling views of Central Park and the Manhattan skyline. The changing seasons showcased in Asiate’s Central Park views are also reflected in the seasonal menu featuring dishes made with fresh, local ingredients brought together in a balance and harmony inherent in every aspect of Mandarin Oriental. Renown designer Tony Chi used Asiate’s 35th floor Central Park views as his inspiration for the restaurant’s design. The interior is crowned by a glittering tree-branch sculpture hanging from the ceiling that symbolize the trees of Central Park in winter and a dramatic wall of wine that houses over 1,300 bottles of the restaurant’s collection. Located on the sky lobby, the Lobby Lounge is the perfect place to enjoy a light fare, afternoon tea, or cocktails and late night desserts with dramatic views of Central Park and the City skyline. With walls of windows that greet guests as soon as the elevator doors open, the Lobby Lounge’s most prominent feature is its stunning panorama of Central Park and the Manhattan skyline. The decor is a modern blend of Oriental touches and art deco chic, with a luxuriously cozy residential feel. It’s the perfect place to unwind after a busy day in Manhattan. And the finishing touch to this dramatic setting are two immense paintings by internationally acclaimed artist Valerio Adami, inspired by his vision of New York and Broadway. It’s an experience not to be missed. Trendy yet utterly inviting, there’s always a lively atmosphere at the chic and fashionable MObar. The focal point of this stylish cocktail venue is the island bar in polished, hammered nickel. Inspired by 1930s residential pieces, it picks up the sparkle of the evening and provides a centerpoint around which guests can gather to catch up with old friends or make new acquaintances. Tailored leather seating in cozy nooks, and chic high-top tables divided by hand-sculpted brownstone and a wall of velvet allow for more intimate socializing.